On a street lined with statuesque Southern mansions, Joe and Evelyn Adams’s cottage looks like your baby sister at a debutante ball. This 1854 house is no shy wallflower, however. Painted coral-pink with green shutters and puffed up with an octagonal front bay wearing a conical roof like a cocky cap, the eight-room Georgia cottage packs a lot of style and history into its 2,800 square feet. Joe, who is a Realtor, former art teacher, and fine artist, had admired the house on Macon’s historic and grand College Avenue for years before he and Evelyn bought it in 2010. “I’m not crazy about Victorian style, but inside it’s not Victorian at all. The house is really more of a vernacular cottage, and that is what appealed to me,” Joe says. The Victorian features on the exterior—turned porch balusters, brackets, decorative-glass front door, applied trim on the bay, and paneled exterior siding on the front porch—were probably added in the 1870s or at the turn of the 20th century, he says. In the living room, African Kuba cloth covers pillows on the Lee Industries chairs. A 17th-century Belgium tapestry backs an Empire gilt console. Architect: Shannon Fickling, Shannon Fickling Architect, 155 Oak Haven Ave., Macon, GA 31204; 478/737-8893, shannonficklingarchitect.com. Wall paint (“Light Pewter” #1464): Benjamin Moore, benjaminmoore.com. Console table (Empire gilt console from the Nest, Highlands, NC, now closed); lamp and accesories on console; table between chairs; coffee table; flower holder on coffee table: owner’s collection. Blue-and-white jars under console: Chinese Export porcelain. Pair of chairs (#5099-01): Lee Industries, leeindustries.com. Pillows on chairs: African Kuba cloth. Flowers: Canaan Marshall Designs, canaanmarshall.com. Joe credits a previous homeowner, who was an antiques collector, with adding the house’s four marble mantels. (Faux grained-wood mantels that were probably the originals were found in storage on the property.) A neoclassical marble mantel in the parlor may be by 18th-century British architect Robert Adam. Wall paint (“Light Pewter” 31464): Benjamin Moore, benjaminmoore.com. Chair (from Charles Faudree’s estate): antqiue. Art: by Joe Adams, joeadamspaintings.com. Porcelains in bookcase (Derby and Meissen); urns on mantel (Old Paris urns): owner’s collection. Paintings (many by Joe and displayed in gilded frames), porcelains, and collectibles (from African masks to charming New England silhouettes) are artfully arranged from wainscoting to ceiling on nearly every wall of the house. Walls in the front parlor are painted a rich charcoal hue that creates a dramatic backdrop for artwork surrounding a two-tone marble fireplace. Deep plaster crown molding, wood window shutters, and wainscoting painted crisp white heighten the drama. To add a touch of formality, Joe hired a decorative painter to embellish the wainscoting in the parlor, dining room, and living room with a marble-like pattern that complements the antique mantels. Furnishings are a blend of period-appropriate antiques—many purchased at estate sales—and modern items, such as a Lucite coffee table, a zebra rug, and a chrome-frame side chair with caned seat and back. 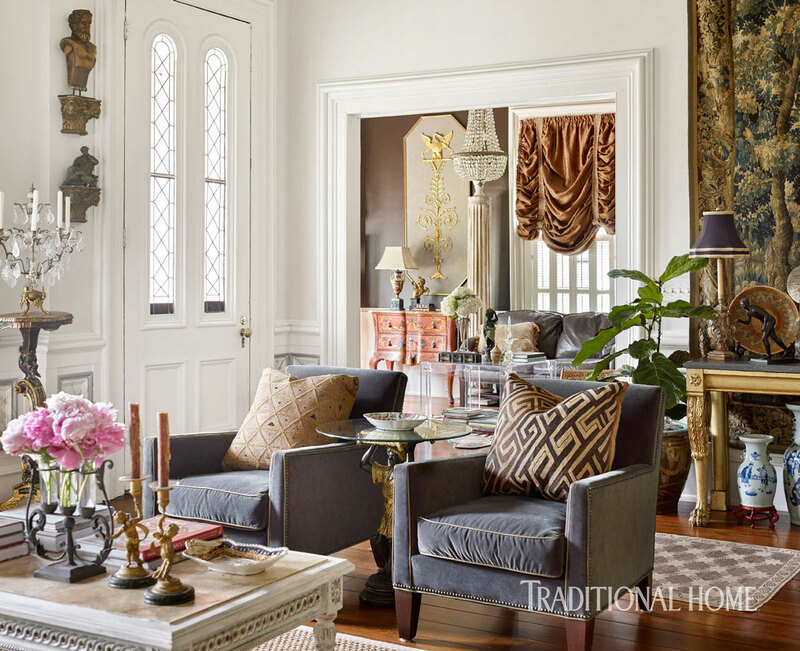 Two salvaged wood columns that the couple bought in North Carolina are topped with vintage wood urns and flank the gray leather sofa in the parlor. Joe’s artist’s eye is evident throughout, with pleasing juxtapositions of his colorful abstract paintings with antique Derby, Meissen, and Chinese export porcelains and Belgium tapestries. Wall paint (“Black Bean Soup” #2130-10): Benjamin Moore, benjaminmoore.com. Lucite coffee table: Scott Antique Markets, scottantiquemarket.com. Pedestals flanking settee (antique); urns on pedestals; commode (Florentine, c. 1940); lamp on commode (antique); panels behind commode; window treatment: owner’s collection. Desk (antique): Scott Antique Markets, scottantiquemarket.com. Chair at desk (painted by homeowner): vintage. Sculpture behind desk: antique bronze by Clodion. Colors in an abstract painting by Joe Adams complement hues in the nearby porcelain. The crystal gasolier (now electrified) hanging over the mahogany table is said to have come from a French sailing ship. Chandelier (gasolier from New Orleans): antique. Dining table; dining chairs (antique); chair-seat fabric (unknown); plates on shelves (antique Chinese Export); figures on mantel (antique); wine glasses (estate sale); silver bowl on table (antique): owner’s collection. Area rug: Upcountry Home, upcountryhome.com. Art above mantel: by Joe Adams, joeadamspaintings.com. The original 1870s brick fireplace is the focal point of the renovated kitchen. The Adamses added painted wood plank walls and the beamed ceiling, which is made with recycled lumber. The cabinets and perimeter countertops were built with old heart pine. The island is recycled beadboard with a stainless-steel top. Perimeter countertop: heart pine in parquet design. Bar stools; chandelier: owner’s collection. Range and hood: Kenmore Pro, kenmore.com. Mantel (exposed brick fireplace with heart pine mantel): existing. Coral is repeated throughout the interiors, including a leather wing chair in a kitchen sitting area by the original fireplace. Wall paint (“Scottish Mist” #510-3): PPG Porter Paints, ppgporterpaints.com. Settee (estate sale); pillows; stool; chest of drawers (antique pine); table lamp (vintage); portrait above settee (antique); silhouettes (antique); plates amd trays on wall: owner’s collection. Orange leather chair: 14th Street Antiques & Interiors, 14thstreetantiques.com. A center hall through the house leads to a back sunroom with a whitewashed floor decorated with a Greek-key border. An antique gilded settee sits in a sunny window bay. Greek key pattern on floor: by decorative artist Susan Raza, 478/292-2425. Art above commode: by Joe Adams, joeadamspaintings.com. The inside wall is original beadboard that was covered by bookshelves. Joe finished it with a tinted wax. A piece of Joe's art adds color above the commode. An antique mirror topped with a tapestry panel reflects light, making the space feel larger. Narrow louver shutters filter light and suit the style and scale of the room better than more contemporary wide-louver plantation shutters, Joe says. Bed; bed linens; animal-print blanket: owner’s collection. Bedside tables (discontinued): Horchow, horchow.com. Wall brackets behind bed; mirror above console table: Francie Hargrove, franciehargrove.com. Urns on brackets (Capo De Monte): antique. Console table; bench under console; chair beside console (painted by homeowner); lamp on pedestal table: vintage. Pedestal table; stool by mantel (Chinese export): owner’s collection. A former bedroom was converted into the spacious bath with a vintage claw-foot tub. A washer and dryer are built into the room’s center island. Wall paint (“Light Pewter” #1464); Benjamin Moore, benjaminmoore.com. Lamp; mirror; art; area rug: antique. The Adamses’ grandsons often spend the night in the Napoleon-theme room. Statues of Napoleon and his generals are displayed on ornate gilded wall corbels. Table between beds; portraits behind bed; table to left of bed; area rug: antique. Table lamp; eagle corbels; figures on corbels (decanters, Napoleon and his generals); trumeau above mantel (painted by homeowner): vintage. A former cabin behind the house was Joe’s studio until he moved to a commercial work space. The original wood frame was bricked over by a previous owner. Joe still uses the cabin to store art supplies. Table (iron and marble): antique. The fire that prompted refinishing the floors also prompted repainting the exterior. The couple chose coral so the house would stand out among its neighbors, most of which are brick or frame structures painted white. “I wanted coral, although everyone calls it the pink house,” Joe says, adding he finds it amusing that some acquaintances refer to the house as the Barbie cottage. Exterior paint (“Crimson” #1299); trim paint (“Navajo White”); shutter and door paint (““Great Barrington Green” #HC-122): Benjamin Moore, benjaminmoore.com. The interior’s artful mix works—thanks to a warm palette heavy on gray, taupe, and burnished gold brightened with hits of coral, pink, and cobalt blue. “I do love color,” Joe says. That comes as no surprise to the fans of Joe’s artwork and Barbie’s cottage. Elongated windows, porch balusters, and ornate architectural details on the exterior were most likely added to the 1854 house in the 1870s. Tour this historic Charleston home.